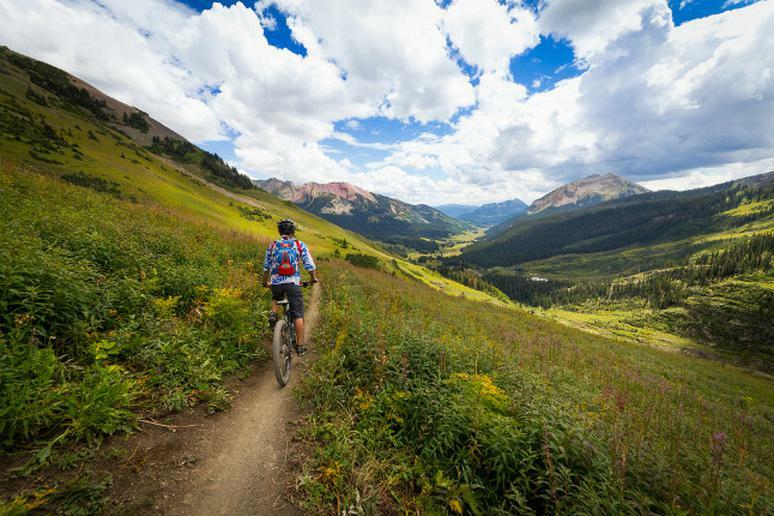 The wind in your face, dirt on your bike and an undeniable thrill—if you’ve ever wanted to try mountain biking, than maybe it’s time you gave it a shot. With the start of summer just weeks away, now is the perfect time to gear up and hit the trails. Hydration Pack—water and storage all in one, a good hydration pack is key when it comes to mountain biking. Helmet—though no one likes to think of the time they crash, it does happen and it’s better to be prepared with a helmet that fits properly. Try it on before you buy and keep in mind it should fit snug, but it shouldn’t block your line of sight. Gloves—though optional, gloves are a great choice for beginners because of the protection they offer in the event of a crash. Gloves also help temper the vibrations from the bike and protect your hands from blisters. Spare Parts and Tools—it’s the nature of mountain biking, eventually on the bumpy ride something will likely break, but that doesn’t mean you have to stop for the day. There’s nothing worse than the thought of having to walk your bike back to the car, so bringing the right tools will save you when something fails. For starters, don’t forget a spare tube, mini pump, multi tool and a SRAM PowerLink. Your local bike shop can add to the list and teach you how to use it—a repair kit doesn’t do you much good if you don’t know how to use it. First Aid Kit—again, crashes happen to the best of us and it’s better to be prepared with a small kit to patch up you and your riding buddies. Sunglasses—from glare to debris, sunglasses are key to keeping your eyes safe on the trail. Wondering which ones to buy? Check out our list of the best sunglasses of 2015. Paper towels or wipes—whether cleaning up your bike or yourself, pack a few wipes or paper towels and you’ll be glad you have them as back up. You may also want to bring power bars or gels, a rain jacket or a few extra layers, depending on the season and for longer trips, you may need some additional gear.